Ways Terrace by Peter Rush. Some of us desperately want to go back and sketch this building again. "I used a 6B pencil first as an outline, then added the colour to minimise smudging. To finish I heavily used the 6B to shade and tone. (squeezing in some more colour when needed) Size A2. Ways Terrace is a public housing building completed in 1925. The architect Professor Leslie Wilkinson had a very strong conviction that Sydney architecture should be Mediterranean. So no, this is not Italy. It really is a very clever building, a big variety of flats, a lot of them two story with loggias and balconies. Pretty much unchanged since construction." 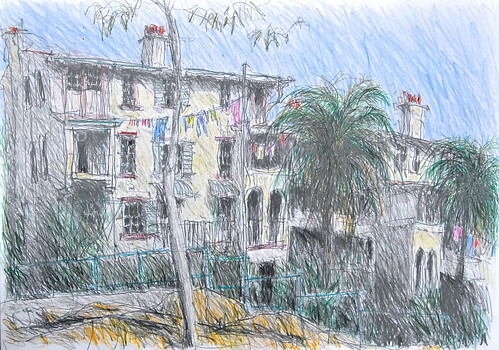 "USk Sydney organised a sketch crawl through Pyrmont, a visually stimulating harbourside suburb. Most of the suburb has been re-developed which makes anything 'old' stand out even more than it otherwise would. 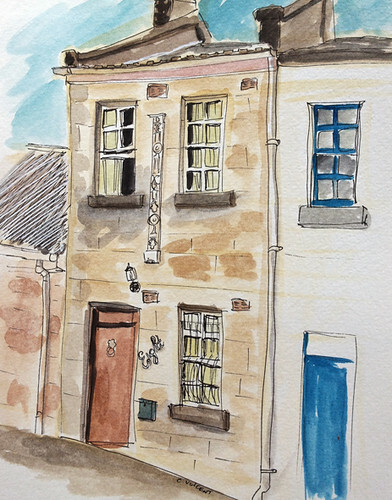 The many public houses were homes-away-from-(miserable tenement) home for most of the resident industrial workers of last century and the century before that. I gridded up this RH page for a routine 'slow' sketch, working each of the nine panels for about 10 minutes each. I was pleased with the visual variety/interest created in the bottom RH corner (invariably the weakest in most people's work) but attention quickly turned to the centre panel with the 1897 Terminus Hotel, now closed and overgrown with ivy, and building construction behind it. I was pleasantly surprised to find the ANZAC Bridge in the upper RH corner. After about an hour, I started drifting across the gutter because the former bakery and its roofline were as intriguing as this intersection. I found the interplay of greys very attractive (shadows, bitumen) but they're impossible to translate into watercolour effectively. Being a "sketch", a lot of aesthetic problems go unsolved for later resolution over time, e.g. 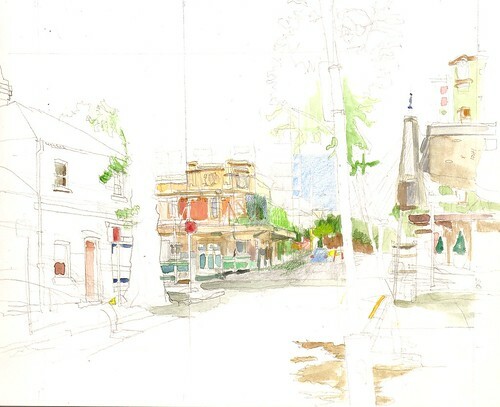 moving from spot watercolour; trees invariably occupying the top third of Sydney streetscape sketches these days - trees being noticeably absent in street sketches and paintings of the city done fifty years ago, by comparison. I notice Jane Bennett, long-time visual recorder of this suburb, has tackled this pub and bakery." 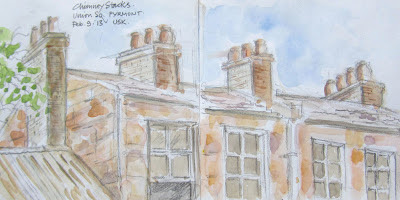 "It was those chimney stacks atop the sandstone cottages which caught my eye at Union Square…perhaps a touch of nostalgia (from someone who grew up in a cold northern city in the UK)….. and well, I also like sash windows. Someone popped his head out of the open window but he was too late to feature in my sketch! This pub, The Royal Pacific, beautifully positioned on the corner of Harris and Jones Street was too good to pass up with the old and modern lettering and was perfect to fit the format of my open sketchbook. As I was sketching here, I was a little bemused when a passer-by stopped asked me if I was recording the traffic flow!…….hmmm." "So much history, so many lovely old homes, shops and pubs." Reminder next event in Sydney is this Saturday 2 March. We are doing a crane crawl at Cockatoo Island. We would love you to join us if you are in Sydney. However, if you are not, we would still love you to join in the fun and go out and sketch a crane close to you, wherever you are in Australia or the world!